Fly fishing is so much fun! When hearing this, many people say, "Well, if it is so much fun, then why am I so discouraged every time I try it? I bought a fly fishing outfit, and I haven't caught anything yet. In fact, that outfit is going to the garage-sale corner of the garage." Many people find themselves in this bewildered state of mind. They are frustrated, because there is so much to learn. To top it off, they feel nobody can or will help them. That is where the Kern River Fly Fishers Mentor Program can help. If you have never tried, tried but failed, or are experienced but need help in any of the fly fishing disciplines, please contact a Board of Directors member or call the club phone number. 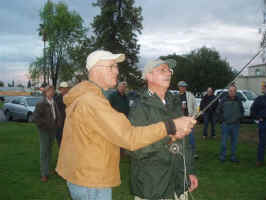 We will assign one of our experts to help you learn the skill(s) and regain your self confidence as a fly fisher. There is only one requirement. You must be a member.